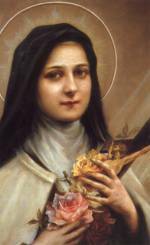 As a very young child in Alencon, France, Thérèse told her father, who she was very close to, that she would be a saint. 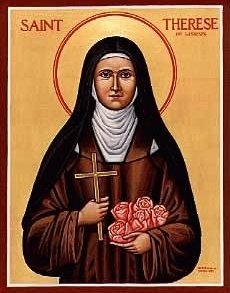 An older sister, Pauline, was the first to act on a call from God and entered the Carmelite Order; she was closely followed by another older sister, Marie. Here sisters' consecration inspired Thérèse to follow in ther footsteps. Because of her age, only nine, the local bishop discouraged Thérèse's entering the Order. However, at the age of 14, Thérèse met Pope Leo XIII where she made a personal appeal to be allowed to become a Carmelite nun. Pope Leo XIII responded that that decision should be left to the bishop. When she was 15, that permission was finally given. After Thérèse's father's death, the last of the four sisters, Celine, also entered the convent. In 1896, Thérèse requested to become a missionary and was selected to join a convent in Hanoi, Vietnam. But before leaving for her new duties, she was told by Jesus Christ, her "Bridegroom", that she would soon be joining Him. As a Carmelite nun, Thérèse spent much of her time "alone with the Alone", in prayer, meditation and penance. Leading this type of cloistered existence, no one, not even the other Carmelite nuns, knew that she had been on the receiving end of special favors and graces from God. During her lifetime, she was inspired to put to paper her life. She named her diary The History of a Soul. It was only after other Carmelite nuns had read her journal had they realized how special she was. Still today, The History of a Soul is widely recognized as one of the most beautiful works on spiritual life. 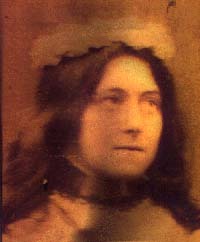 Thérèse of Lisieux was later to be known as "Little Flower."